Mohawk Mountain in the United States (Connecticut State) is a medium sized ski resort with 6 ski lifts ( 5 chair lifts, 1 surface lift) but it only has 195 metres (640 feet) of vertical descent. Mohawk Mountain has 107 acres of terrain over 24 trails with a total length of 40 kilometers (25 miles). 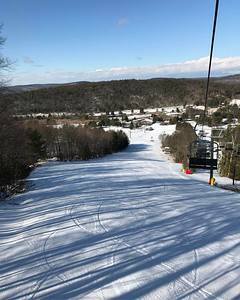 Mohawk Mountain is evenly suited for both advanced and intermediate skiers and snowboarders but with some terrain for beginners. We have no information about the existence of any cross country ski trails at Mohawk Mountain. Nearly all of the trails at Mohawk Mountain are covered by snowmaking. The nearest airport is at Hartford.